Plants get their energy from sunlight. And humans get theirs from food. The abundant energy from the sun was thought to be pretty much useless for us mammals. Plants got it all to themselves. And we got to eat the plants, of course. Well, according to research out of Columbia University Medical Center, there is a considerable possibility that animals (including humans) may be “solar powered”. In other words, when we consume green vegetables, the chlorophyll metabolites appear to enter the mitochondria, where they work together with sunlight to supercharge energy production in our cells. Maybe THAT explains the energy boost we get from juicing, drinking more green smoothies, and pumping up our green veggie consumption. It’s definitely possible. And the science is beginning to back it up! 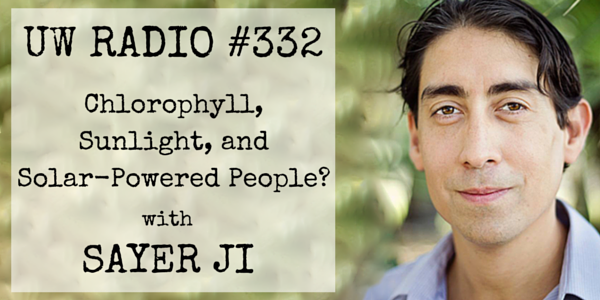 On today’s episode of Underground Wellness Radio, Sayer Ji — Depression Sessions presenter and founder of GreenMedInfo — reveals a new paradigm in human energy production that will make you think twice about skipping your veggies. Click the PLAY button at the top of the post to listen to the entire interview! Does Skin Pigment Act Like a Natural Solar Panel? See you next week with some of my favorite clips from The Depression Sessions.